This is part of a fascinating genre of books, self published military histories. They are not like the buckram bound regimental histories lettered gilt on spine and front cover with crests etc. They are more likely to be paperbacks written by old soldiers and sometimes their widows, many came out of WW2 in US and UK and are often very hard to find. Chick Marrs Quinn. 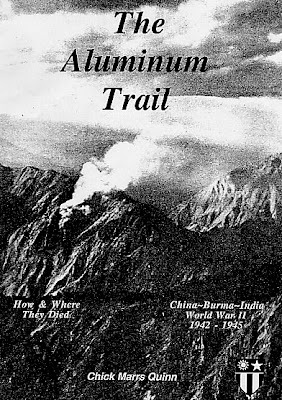 THE ALUMINUM TRAIL (CHINA-BURMA-INDIA-WORLD WAR II, HOW AND WHERE THEY DIED. Self Published? USA (FLA?) 1989. AVIATION/ MILITARY HISTORY AND WARFARE. Not a lot known about this wanted book except that it's about US aerial operations in the Pacific Area in WW2 and CMQ was a woman last heard of living in Lake City Florida. The book is dedicated to 1st Lt. Loyal Stuart Marrs, Jr., Chick's husband who was killed February 27, 1945. A letter to her from someone at the China National Aviation Corporation site in 2005 was returned unopened. The CNAC site has good info on many other books about US aviation in the Indo - China area in this period. The 'aluminum trail' title refers to the pattern of air crashes in these difficult regions, especially the Himalayas. I suspect persons who lost relations and loved ones flying so far from home eagerly want this rare book and not a few libraries. To lift the giant screaming plane...above the mountains drenched with rain..
Black ominous clouds and gale winds blow...amid the ice and swirling snow.. They gave their lives, so we might live...what more can any person give. My Dad and I have been searching for this book for quite some time. He's 87, a former Hump Pilot; I would like to find it for so we can read it together. Any information or help would be appreciated. My Dad flew the Hump - he passed in 1986. I've come across some old letters he wrote to Mom, but am going slowly through them. I don't recall him saying all that much about the experience and I'm now wanting to learn more about that area of WWII. My Uncle Irwin "Zipper Zaetz" lost his life on the Aluminum Trail. The wreckage recently found after much work by my cousin Gary Zaetz. Hoping for full recovery of wreckage in Spring 2009. He has one surviving sibling & his widow in their mid-late eighties. An alternative is "Flying the Hump" at Amazon.com and Bookfinder.com has it cheaper plus other items with these words in the title. There is a seller on Amazon who is selling copies of this book for $35. I just ordered my copy and am hoping to see it soon! I looked for this book for years. It is still available on Amazon.com for $34.00. It is a reprint with spiral binding. I bought one recently and am very pleased. The book is what is says, how and where they died. It is a history of every plane that crashed in that theater, what happened to the crew if known, and location of the crash if known. I bought it for my father who piloted a transport over the Hump in 1944-45. Seller is willettr4. When I received the book, it had a flier for a book written by Mr. Willett. If unsuccessful at buying the book through Amazon, Mr. Willett's email address is listed as: willettr@bellsouth. net.